My Uncle Publishes a Book. I help in processing and editing the photos. It was a quick two day job and I had to work with what was provided. 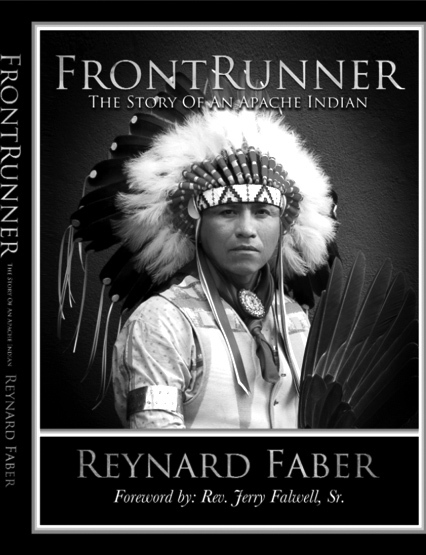 Maitland, Florida- The NEW Xulon Press book released today, Front Runner-The Story Of An Apache Indian, is an overcoming, spiritual journey. All who read this incredible story of one Apache Indian are blessed as they discover the secrets of its author's astounding daily walk with God. Reynard Faber, a member of the Jicarilla Apache Nation serves as the Honorary and Traditional Chieftain for the Jicarilla Apache people, was born into poverty, abuse, alcoholism and even prejudice from within the white man's boarding school in the late 1960's and early 1970's. For years it seemed these tragic events and circumstances would overcome him and ruin him. But, one fateful day he "accidently" discovers the remnants of a tattered old Bible and devours it's teachings. Soon thereafter, in child-like faith he expects God to act, and so engenders miracle after miracle experienced on the Reservation and around the world. Available now at: www.Amazon.com and booksellers everywhere. Author is available for phone and in-person interviews as well as motivational speaking.